Taste test: This is an interesting mixture of sweet and salty snacks. 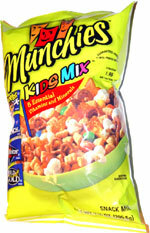 On the sweet side, there's Cap'n Crunch pieces and the 'candy coated chocolate pieces' (aka M&Ms). On the salty side, are snacks like mini Doritos, pretzels, Cheetos Asteroids and some white cheddar popcorn. The combination is interesting even though the popcorn was a little stale. After a while, we started just picking and choosing, looking for the Cap'n Crunch and chocolate candy pieces. Smell test: Smells like cheddar popcorn.